People love DeliverLean’s convenience of hand delivery to home or office. But its our meals and our chefs who keep our customers coming back every month! 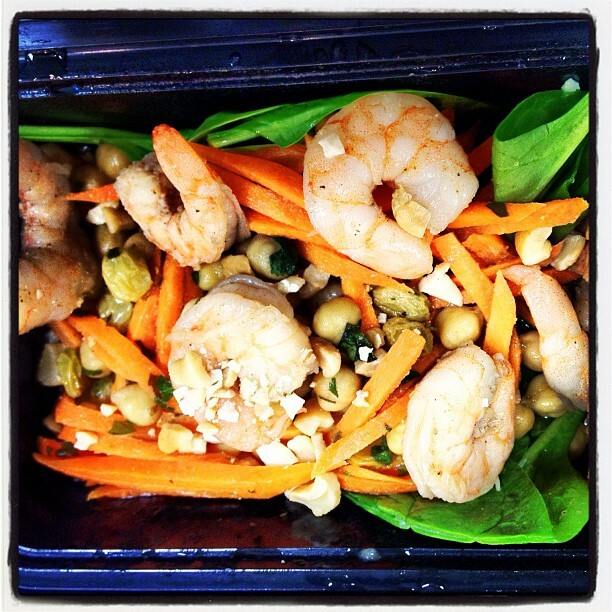 SuperFood Spotlight – Moroccan Carrot & Chick Pea Salad with Cumin Scented Shrimp. This recipe has three ingredients that I find most impressive; cumin, cayenne pepper, and chick peas. Sometimes the spices are the healthiest components of the meal. Cumin for example, is a potent seed that is prominently used in Mexican, Mediterranean, Indian, Middle Eastern, and certain Chinese cuisines. Cumin has a high concentration of antioxidant compounds that provide numerous health benefits. Cumin has even been known to improve immunity, as it is extremely high in both vitamin A and vitamin C. It also increases your metabolism and improves the absorption of nutrients throughout your body. Another spice used in this dish, with an abundance of health benefits is cayenne pepper. First and foremost, cayenne pepper has been known to increase metabolism. It also has a ton of health benefits in regards to the circulatory system, as it feeds the vital elements into the cell structure of capillaries, veins, arteries and helps adjust blood pressure to normal levels. Cayenne pepper is also very beneficial to heart health as well, considering it works to get rid of the bad LDL cholesterol and triglycerides. Finally, aside from the spices, this salad also contains a full serving of chick peas. The main reason I always recommend our clients consume chick peas is because they are very filling. They are the perfect natural appetite suppressant that will keep you full for long periods of time. This is because they are high in fiber, which is also great for digestive health. Individuals that consumed at least 28 grams of fiber per day are known to have better blood fat regulation, including lower levels of LDL-cholesterol, total cholesterol, and triglycerides. The Moroccan Carrot & Chick Pea Salad with Cumin Scented Shrimp is included in Saturday’s menu plan, and is absolutely delicious. How could you say no to a dish that is jam-packed with so much flavor, and nutritional content?